Thursday was probably the busiest day for me. Ingo interviewed me about Amarok for RadioTux. (Excellent job as always, Ingo! ;-)) The recording of it is available at RadioTux. Shortly after that I had to rush off to join Alexandra in giving an introduction to community management in free software projects in our “Community Management 101” workshop that was well received. The other days were filled with meetings and lots of talking to visitors and other projects. 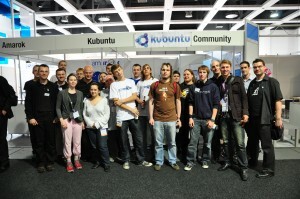 It is nice to see the shift in attitude towards KDE 4 compared to Linuxtag last year. 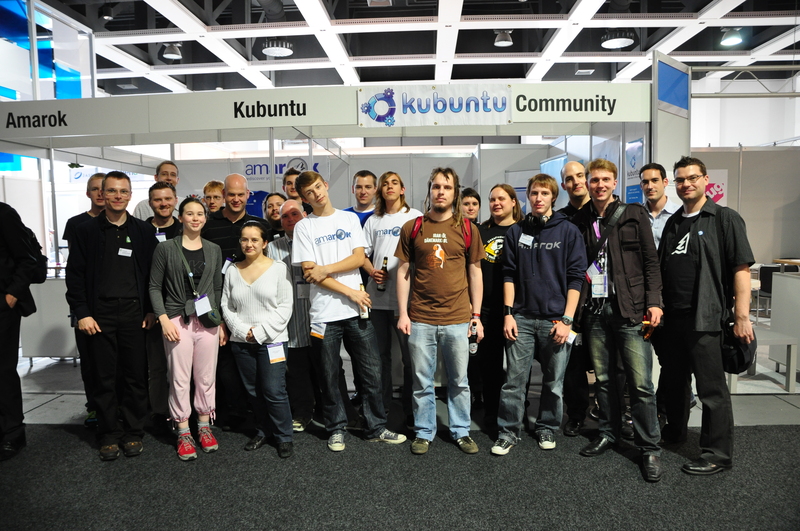 A lot of people came to our booth to let us know they use and like KDE 4 now. This really rocks! Those who were not happy with KDE 4 yet mostly had very minor problems which we fixed in a few minutes; like showing them how to add applets to their taskbar or what the places bar in Dolphin is capable of. Oh and I was surprised how many people first didn’t believe I was running a stock KDE 4.2.4 on Kubuntu on my 7′ EeePC. So once again: The tiny thing does indeed run KDE 4 😉 Special thanks for that to the Plasma and KWin team. Plasma and KWin on the EeePC are quite an eye catcher at events like Linuxtag. Sunday and Monday Frank, Cornelius, Thorsten, Danimo, Dominik, Milian and I met at the QtSoftware office to talk about the future of KDE’s wikis. It was quite productive and results will be visible soon. 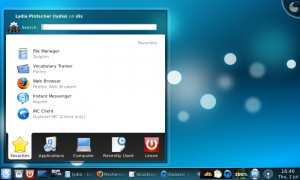 Thanks go to KDE e.V. and Amarok for funding and of course the Linuxtag team for another great event. Why is Kickoff detached from the panel? It should be much nearer ! Hach bei dem Foto werd ich noch viel trauriger weil ich dieses Mal nicht dabei sein konnte … 🙁 Soviel tolle Leute auf einem Haufen, wär echt schön gewesen euch mal wieder zu sehen. Next Next post: Communication ninjas all around?